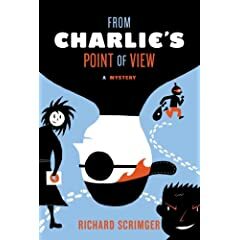 Having enjoyed Richard Scrimger's The Nose from Jupiter, I recently picked up his recent mystery, From Charlie's Point of View to pass the time on a four hour plane trip to Chicago and wasn't disappointed. Charlie and Bernadette are neighbors as well as friends, but more importantly, they are a team. Bernadette has a less than happy home life, and relies on Charlie for the support she doesn't get at home. Meanwhile, Charlie has loving but over-protective parents, but his blindness leaves him vulnerable. Bernadette willingly takes on the responsibility of being Charlie's eyes and together they manage their respective home lives and the pitfalls of bullies and even dog attacks. A third character, their quirky school mate, Lewis, also suffering from a less than perfect home life, provides comic relief. The mystery comes up when Charlie's father is mistaken for a bank robber. The three kids set out to prove Charlie's father's innocence. Interestingly, an element of mysticisms is thrown into the works with a quasi guardian angel student by the name of Gideon who pops up at opportune moments. The design of Charlie's Point of View is as ingenious as Scrimger's plot. Black pages mirror Charlie's perspective in addition to the reader's blindness as we follow the kids' path in solving the mystery of who really done it.